Key began his broadcast career at the age of 18 in the San Fernando Valley area of Los Angeles where he anchored a community based news show. He provided play by plays for local high school sports teams and fell in love with radio and television. Key joined a Los Angeles satellite radio station in 1982 as an on air personality for both music and talk show programs. He also covered professional sports teams in Los Angeles with a weekly radio broadcast featuring athlete interviews. After 6 years in broadcasting, Key joined the Los Angeles County Sheriff’s Department as a Deputy. He has spent the past 24 years serving the residents of Los Angeles County. Key became a Detective in 1998 and remained an investigator throughout his career. Key specialized in financial crimes including identity theft, embezzlement, and real estate fraud. Key traveled across the U.S. teaching about the financial industry, law enforcement, and the public regarding new fraud trends and financial protection. Key re-launched his broadcasting career in 2012. 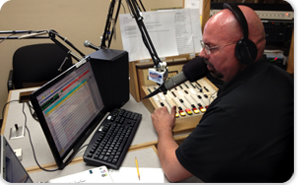 He is an on air personality for AM 1220 KHTS in Santa Clarita, California. He hosts both music and talk show programs. Key also lends his talents to radio and television commercials. Key attended both Los Angeles Valley College and California State University Northridge (CSUN) with Radio/TV/Film as his major. Key attended the 2013 Associated Press Television Radio News Academy.